Do you like your privacy in the bathroom? Hello, yes, it’s me, still obsessing over the bathrooms here. I started this series thinking I’d better get down the stuff that tickles me while I can, before it all starts to seem commonplace. But (and maybe this is just because I’m a bit juvenile that way) bathrooms continue to amuse me everywhere we go (one reason I enjoy Batya’s infrequent series, A Pisher’s Guide to Jerusalem). Something tells me I’m not the only one. My fifth most popular post here is a Things that are cool in Israel episode all about Israeli bathrooms. And people are apparently Googling Israeli bathrooms at an astonishing rate. I hope I can help satisfy your curiosity and earn myself a slice of immortality. In some ways, Israelis seem to “get” the idea of bathroom privacy, even more than in North America. In public bathrooms, for example, the stall walls usually go almost all the way to the floor (except the annoying modern ones that seem to be copying the North American model). Generally, public bathrooms, even the most rudimentary, are more sturdy, soundproof and private here. Yet in the midst of all this privacy, there’s also an obsession with putting a window in every bathroom. Ideally, in every stall. It’s like they think that the fumes are going to kill you if you have to be closed in with them for too long. I already shared with you the pictures of our bathroom window in the merkaz klitah. In this picture, the right window is the bathroom; the one on the left is the shower room, which was separate in that apartment. This is the “outside” of the windows. This style always opens downward into the bathroom. Our new apartment has a different style – your basic swinging-on-a-hinge design which, when open, affords absolutely ZERO privacy. Here’s the view from the inside. Akiva’s working in the kitchen, but I called him over to say hello. This lets me spy on the kids’ bathtimes, or, in this case, figure out what Naomi’s trying to do to her Barbie doll’s hair (ruin it with overbrushing, then overbrush it in a frantic attempt to smooth it out again). One more weird thing about Israeli public bathrooms. In North America, when you get into the stall, the door swings freely, and then there is some type of mechanism to latch the door. The mechanism varies, but in general, a single mechanism does both things – closes the door AND locks it. So when you’re done, you only have to unlatch the door and it’s pretty much open. Here in Israel, for whatever reason, they have made this a two-step operation. Almost every public bathroom has two things: a handle (not a doorknob) to open and close the door, and a latch to lock it. To get out, you have to reverse things: unlock the door, then open it with the handle. I don’t know why this is, at all. I’m thinking maybe they should visit North America and see how productively we use all the nanoseconds we save by not having to repeatedly rescue ourselves from bathrooms (or, in my case, trying to shove the door open because I’ve forgotten there’s also a handle). Are you willing to bear with me for one more potty-related quirk? Wherever you are, it’s easy to tell which room is the bathroom, without asking for directions, because every bathroom door seems to have one of two things: a window or a peephole. 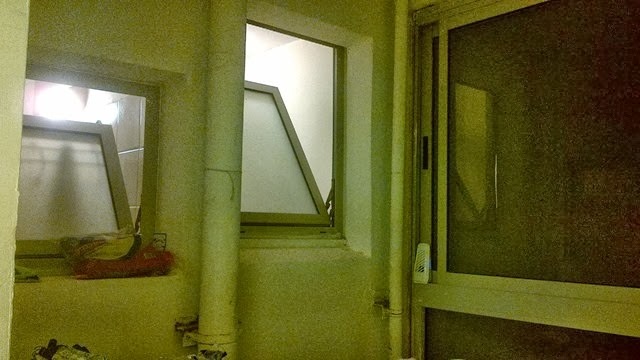 In the merkaz klitah, we had a window. They’re frosted, of course, for privacy. You might think they’re there to let in light, but in this case, more light would have come in the window above the toilet, because the bathroom door opens onto a hallway. Our current apartment’s bathroom door features the Mysterious Hole instead. Here’s the outside view. I literally haven’t figured out the useful purpose of the peephole. It’s not big enough, plus it’s too weird and dusty, to provide significant ventilation or light. And if somebody comes a-knockin’ at the door, what are the odds that they won’t be able to just say their name when you ask who it is? It’s not like you need to peek out to see who’s there. This post has gone on too long, but remind me sometime to tell you about the Crusader Bathrooms in Akko. Really, truly. It’s a Real True Thing. They say Israel is a Land of Mystery. Well, actually, I didn’t read that anywhere; I just made it up. But it could be true. Until I find out, you have my promise that if something bathroom-related happens in Israel, I won’t stop blogging until I get to the bottom of it. I mean… until I have plumbed the very depths of the mystery. Hysterical. I don't have those windows in our bathroom. I'll have to send you pictures, bli neder. LOL. I don't think I really needed that much information about bathrooms in Israel, but it was a fascinating and hilarious read. Thanks! The peepholes and windows in the doors of the bathrooms are there so no one has to bother you by knocking on the door to see if it is occupied. If the light is on in the bathroom, go away and come back later. It took me years to figure out that piece of Israeli etiquette. It's quite considerate, as well as a bit more modest, when you think about it. You really start appreciating it if one acquires an Israeli-sized family of a half-dozen kids in a an Israeli-sized apartment. As for the efficiency of the American single-action method of escape as opposed to the two-step doors in Israeli bathrooms, I have learned that people here are more laid back about life-stuff. They may rush at work, sometimes, but in most things, there is a wonderful "take your time and live longer" attitude. I do enjoy the pace, most of the time. It's funny, because they act efficient, but rarely are.